Exercising in general is great for many things, but it has to be mentioned that there are several types of workout and each of those emphasizes a slightly different aspect of the shape of the body. Also, certain sport activities need to use certain specific exercises in order to develop muscle areas important for that activity. For example, it is obvious that basketball requires from people to be able to jump as high as possible, because better jumping creates a huge advantage in the game. So, how is it done? Even though it might seem that strong and developed legs are the most important thing when it comes to jumping, it is not the case. 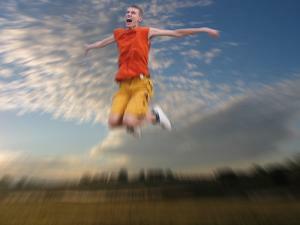 Jumping is a motion that utilizes the entire body and not only the legs. When a jump is analyzed, it is obvious that torso, arms and legs are used in the process. Arms are used for swing which will additionally ease the jump. The torso is also lifted up, not with the strength of the legs only, but also with all torso muscles, especially core muscles. With this said, it is obvious that exercises which activate these muscles will contribute to the effectiveness of the jump (quickness and altitude). Some experts claim that the best possible exercises to jump higher must include squats, leg exercises and of course, all sorts of jump variations. Squat is a perfect exercise for jumps, because it includes similar motions which happen while jumping too. The point of squats is that they can be performed with the help of weights, which will help with the overall strength and explosiveness. Starting position is normal standing positions with feet set at the shoulder width. Legs are slightly bent in knees and the torso is leaning forward (also slightly) but with the back always straight (hips are a bit higher than knees). Barbell is placed on the shoulders behind the neck and held with hands. Now, there are two ways to perform this exercise. From a starting position, the body can go even lower, or it can go up. The added weight will make the body use more strength and that will make the jumping much easier. Core is also essential because these muscles also contract while jumping. For developing this area, crunches should be performed. Classic crunches involve a practitioner who is lying on the floor on his back with hands set aside (hands can be crossed over the chest as well). Legs can be straight or bent in knees. The point of this exercise is to close the distance between chest and legs (or knees, if legs are bent in knees). What kind of weight training do you do?